The owner of this house, a fan of modernist design, wanted to add space to his small Mediterranean bungalow and in the process give the entire house a major face lift. Before the remodel/addition project, the house was chopped into many rooms with very little light and completely cut off from access to the back garden. The exterior stucco showed significant cracking and there was significant water damage and dry rot to the structure and wood windows. DHM Architecture modified the floor plan to increase the flow between the living spaces and create a feeling of openness. Skylights were added to the circulation spine where daylight filters through white oak beams. The remodeled kitchen was completely opened to the back yard with a 12' bi-fold door connected directly to a new back deck. The interior material palette throughout the house was kept simple and light to highlight the natural wood and stone, and to lend a more spacious feeling to a modest house. To stay on budget and within the required schedule the exterior alterations needed to work within strict zoning guidelines to avoid triggering additional zoning and/or design review. 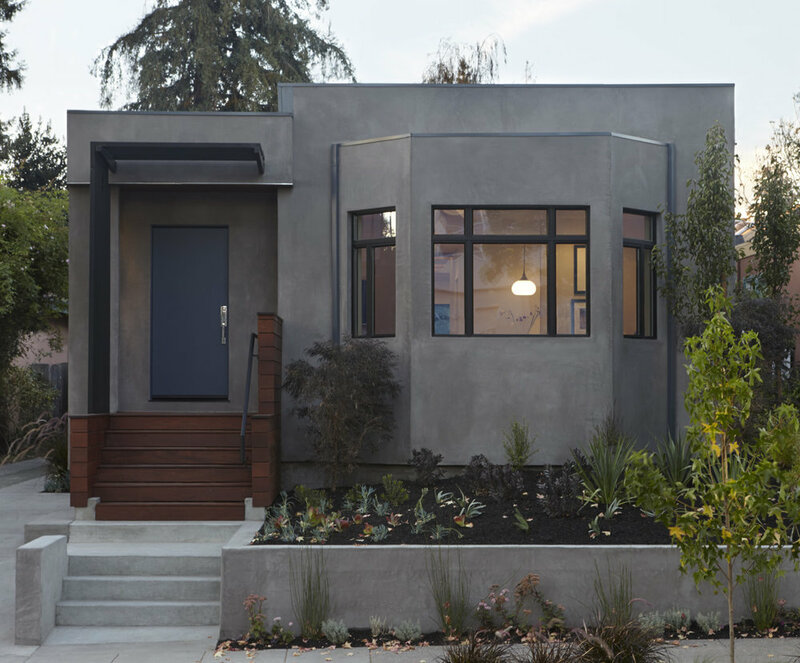 The exterior stucco was replaced with an integral color natural smooth finished concrete plaster and the damaged wood windows were replaced with extruded aluminum windows throughout for a clean, modern language. Natural wood and metal at the entry continues the modern expression in warm materials.